We offer a wide range of diver training from learning how to SCUBA Dive (the popular PADI Open Water Diver course) plus advanced dive skills through the Advanced Open Water course and PADI Master SCUBA Diver rating. Sidemount diving has become common place since it’s introduction to Recreational Diving with Specialties offered through both PADI and TDI. We have Professional level diving starting at Divemaster right through to Master Instructor. We have been training divers since 1975 and welcome everyone who has an interest in diving to come and take up the challenge and enjoy the sport of SCUBA Diving. Keep an eye on our Dive Calendar at the bottom of every page for courses coming up soon. Need some new kit? No problem, we have an extensive range of quality dive gear from all the best brands to choose from and Package deals for all the most popular configurations. Have a look at some of the latest dive gear and come see us for all your dive gear requirements. All year round, we offer you the opportunity to go diving. We dive all the best local Wellington dive sites where the weather conditions allow safe diving. These sites offer something for everyone, from quick easy dives to longer more challenging areas so that there is something for everyone. Our dedicated staff are there to make sure you have a safe and fun dive. We teach Sidemount Diving at NZ Sea Adventures and love the freer feel in the water and the ease of getting in and out compared to twins and diving larger singles off the boat. We stock Dive Rite Nomads which are a great BCD, that is flexible enough to be used with traditional back mounted tanks, Sidemount, twin tanks, and rebreathers. Want to go deeper, stay down longer? We offer a full range of Technical & Rebreather diver training and equipment and are suppliers of KISS Rebreather’s and Shearwater Computers. Certified divers can enjoy extended support services through our dive centre. 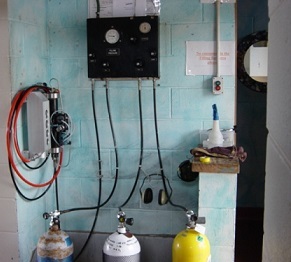 These include Dive Tank fills, Cylinder testing, Dive Gear servicing and repairs. Our Wellington Dive Shop is located next to the only all-weather boat launching ramp on the west coast. We have a good selection of fishing tackle and accessories from Hot Shotz, Wasabi, Black Magic, Gamakatsu and other great brands. There is a great selection of well priced Southern Bait, lures, spinners and sinkers for every job. Also great buying are our Rod and Reel combos from Jarvis Walker and Rovex.